Hi, I’m Jes. My husband Tom and I have been working hard over the last year to get our little farm set up. Our 2-year old son has been such a big help too *wink*. It was my idea to move to a farm and start raising fiber animals. However, my amazing husband went along with it (without much hesitation, to my surprise) and then worked enthusiastically to complete all our fencing & other setup plans for months after our move here. 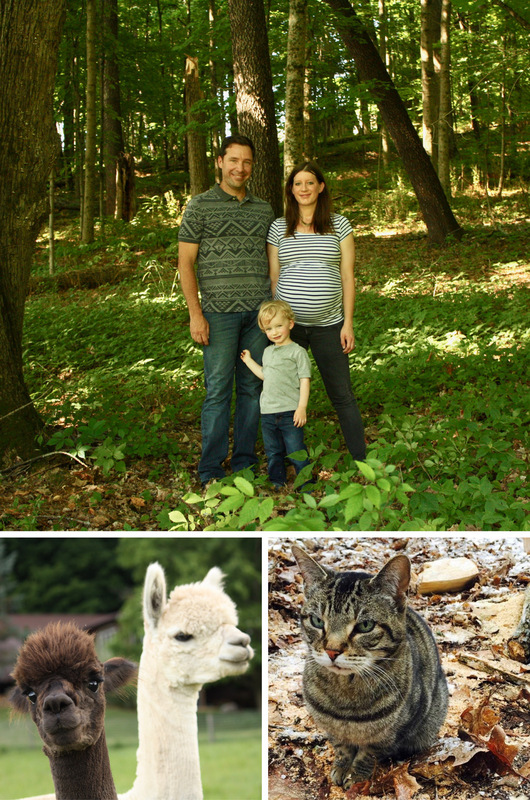 With our second son on the way, we’ve decided to start small with two huacaya alpacas, Iroquois & Tribute. We call them our “fiber boys”. As the first additions to our farm, these two will always have a special place here. Then there’s Josie. She’s our 14-year old tabby cat who patrols the property as one of the best mousers any farm could ask for. Our “good ole barn cat” is still very healthy & active for her age. We’re lucky to have her around! Last summer, we found our dream property in the small town of Granville, Ohio and moved from the suburbs of Columbus out to the countryside of Licking County. We left our flat, 1-acre property (where we held our backyard wedding in 2013) behind and traded it for 8 acres of rolling hills and green pastures. I was raised in the country, in SW Ohio, so this property really takes me back to my childhood. There’s even a pond similar to the one we had! With limitless outdoor activities to choose from, I know our boys are really going to love growing up here. Unlike ventures of the past, this business will allow us to involve our children in the learning process and in everyday farm life. That’s something we’re truly excited about! We know reaching all our business goals won’t be easy. Just getting the farm set up to bring the boys home was a huge project in itself and took several long months to finish (even still, some aspects are ongoing and our to-do & to-improve lists will most likely never be complete). It’s been such a busy year and now that the adrenaline from all the hard work has worn off, I’ve had more time to step back and realize that this is actually all really happening! Pretty darn exciting, if you ask me. Since I was big enough to pick up a ball of yarn, I’ve been knitting, crocheting & sewing and have only lately started to explore new territory on the fiber side of things. To say that I’m mostly self-taught is something I’m really proud of. Now, it’s time to learn some new skills! My current research includes learning to process fiber and spin on a drop spindle, as well as how to handle and care for our sweet alpaca boys. I’m so excited to see where this takes us! My plans at this time are to continue to sell craft supplies & vintage items through my Etsy shop “Farm Fund Destash”. While in the meantime, I hope to speed through the learning process, so that we can open up shop selling our beautiful natural fiber & yarn someday soon! I’ll be using the farm blog as a spot to document our progress. My goal is to post often and to explore a variety of (somewhat) related topics. There’s a lot to learn and mistakes will be made along the way. We hope that you can learn from our experience as well, as you work toward your own goals!